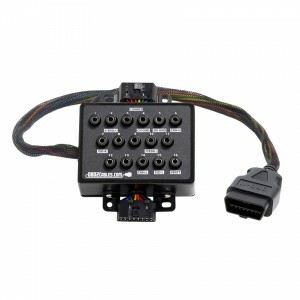 Quickly and easily check the integrity of all available signals coming off the OBD-II port with confidence. Our breakout box provides the opportunity to check signals under load quickly on each and every pin with certainty, and without worry of damaging a vehicle’s OBDII port. 3 foot male OBD II cable. Get out from under the dash and troubleshoot where you can see what you’re doing. Rugged, durable sheet metal construction. Concentrate on the vehicle’s symptoms without worrying about damaging the breakout box. Standard female banana plugs. No need to buy special test leads. Grab your meter or scope, plug in, and get results. Labeled signal lines. All power and standard CAN, ISO, J1850 lines are labeled, so you can be certain that you are monitoring the proper connection points. Two J1962F connectors. Monitor the lines while having your scan tool plugged in, along with any device your customer may normally have inserted in the OBDII port. Check the signals in-line and under load to get a complete and unobtrusive picture of signal behavior.